iminusd has alot of stuff going on this weekend and i thought i should share since i'm here. sub zero is a really big thing here in san jose, and iminusd will be out there with a tent, as well as out friends from boombotix, as well as pops fabrication. "Focused on emerging and present subcultures thriving in our region, SubZERO is a diy, artistically bent, hi/lo-techno mashup where street meets geek. Come downtown on June 3rd to San Jose’s SoFA District from 6pm ’til midnight for an inspired evening of arts & culture. In addition to the South FIRST FRIDAYS monthly art walk you’ll find outdoor stages of entertainment plus artists, performers & musicians celebrating the indie creative spirit! (on South First Street between San Carlos & Reed Streets)"
this is the next day and will be much smaller than the sub zero festival. paseo de san antonio to navigation consoles is a street, but to san joseans it is definitely not. this is actually the walkway to where iminusd is nestled in, and there are some pretty cool shops in that area that sometimes get overlooked by the hustle and bustle. 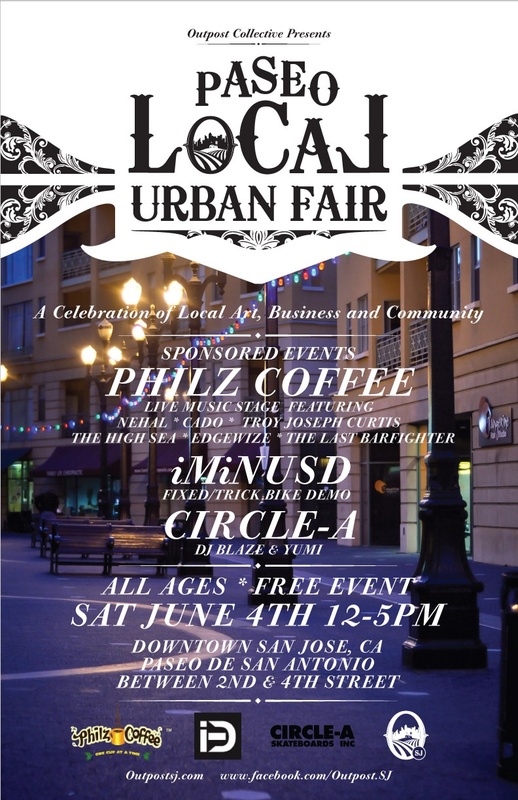 circle a is a wonderful skate shop that i used to frequent in highschool, and philz coffee will keep you wired. it's a very local-centric event... something right up my alley. "This Urban Fair is a showcase of the local art, business and community that exists along the Paseo. Paseo Local Urban Fair is a project that has developed out of conversations with shop owners along the Paseo looking to increase commerce and foot traffic along the Paseo especially in the summer months when SJSU students are vacant from Downtown. The first weekend in June is also host to SubZERO art festival and other art and music happenings. The Paseo has developed a great community of regulars, residents and retail. Outpost collective aims to celebrated the organic local culture that has sprung up from the Paseo, support the local business owner working hard to contribute to Paseo life and connect Downtown San Jose to this great walkway of commerce and culture. Blow is a list of times and scheduled events and opportunities. A community of visual artists, crafters and makers will be set up along the Paseo to create, trade and sell art." two great events. you should go. i'm thinking about it.